PixelHealer Try to fix dead, stuck or hot pixels by yourself, before running back to the store! Its use could not be simpler and more direct. ... PixelHealer works as a defibrillator, looking to revive pixels with a bombardment of colors. PixelHealer is a bit of software from Aurelitec that's designed to fix pixel problems, and it's a free download for Windows, which means it ought to be your first stop. It may be worth a shot considering that the only other options you have are to return the screen/buy a new one or to live with it. 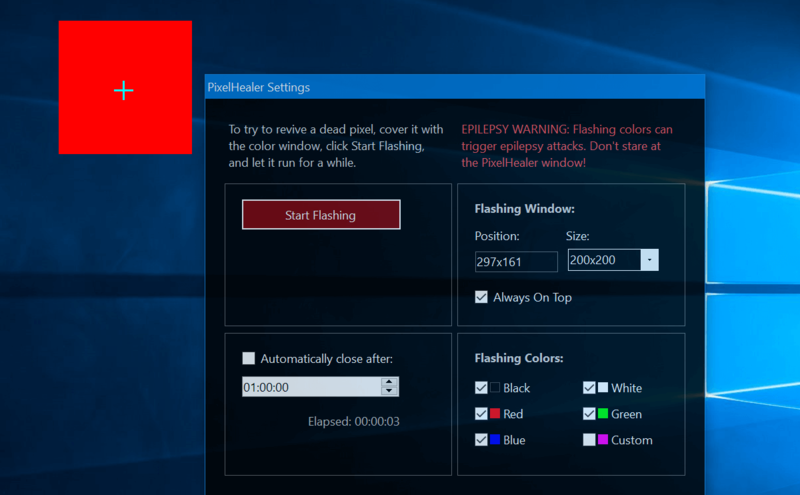 PixelHealer is a very simple and straightforward software and there is nothing in it that users have to do manually, apart from some settings. You can use PixelHealer's flashing color box on the affected areas to try and jolt the pixels back into shape. ... PixelHealer can be used instantly without the need for installation. A very interesting application that can help you get rid of the so-called dead pixels, which are one of the main reasons for complaints and monitor tossing. ... Simple setup, effortless utility. Besides being practical, it's also portable, so it can be carried around on a mobile device to help you fix multiple screens. ... PixelHealer has an intuitive interface, and it's easy to use.